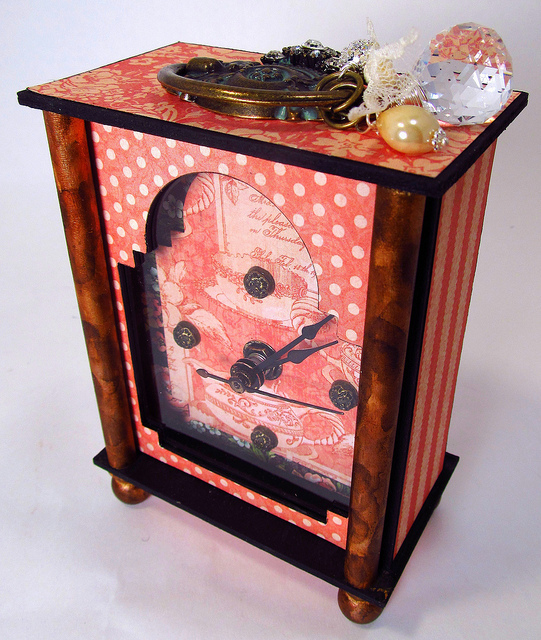 The Gentleman Crafter: Carriage Clock Tutorial Is Up! You know, every time I think I can breeze through getting a tutorial out there, It just ain't so folks! There is no breezing to it! LOL! What time is now? 11:33 p.m. and I started it as soon as I got home from work! LOL! Well, there was about 30 minutes there that I treated myself to a nice walk, so it wasn't exactly all pattern writing! I was really good tonight, actually the last few nights and went for a walk! I gotta get some of this poundage off or I'm really going to need to sell patterns to buy some new clothes! I also got my haircut and that always makes me look a bit plump. Hahahaha! Short hair round face! I'm working on it though! I even listened tonight when my body said, "Whoa Boy! Do you really want all that...aren't you full?" Yes, I came from the same generation alot of us did, where we needed to clean the plate...Where the difference comes in is that I lick the plate clean! That's an extra few calories! :) At least I'm trying! Vacation poundage is the hardest to take off! Rephrase that, Fried Low Country Cooking is the hardest to take off! But so far 5 pounds! Gotta keep it up! Well, I'm seriously exhausted! I better hit the hay and pray the sandman comes early tonight! Thank you all! Have an awesome night and beautiful tomorrow! I appreciate your hard work. The clock is beautiful. I wish I could take off 5 pounds that fast. Sleep well. the clock is really pretty! Preaching to the choir about weightloss here...oy. I walked today, too..3rd day in a row. I wish you luck in your efforts!! It's very hard! Congrats on the 5 pounds so far!!! Well done Jim on both accounts. Hope you get a well deserved nights sleep. Wow..You are an amazing talent. Congrats on the 5 lbs...Vacation weight says on me as if it was on vacation! Hope you have a good rest. We need to support each other! I have so far lost 9 pounds on my way to....well, lots more! I gained one on vacation, but lost it and one more since I've been back. woot woot. The project is amazing, as always. Don't hate me, but I lose weight on vacation. Always on the go. Last vacation I lost about 11 lbs. This would be an awesome gift for my sister. Running over to Etsy to get my copy now! You're not fat - just kind of cuddly! Well done anyway. The clock is beautiful! Nice work. I know about cleaning your plate and licking the bowl! Always did it with ice cream and hershey's chocolate. Funny thing is last week, I made V-8 juice from scratch. It's delicious! but it's so think, I want to lick the glass. . . not so easy! Thanks Jim for the heads up. Just picked up my tutorial. Great for Christmas gifts. I have been trying to get out and walk more also. I managed to pickup a few extra pounds lately as well as an extra year. Making me feel kinda depressed - the older you get, the harder it is to regain that youthful figure. Who ever said you can age gracefully, should have been shot!!!!!! Mother nature is not kind in our so called golden years. Not that you'd know anything about that yet. But it is what it is, so we just have to deal with it the best we can. Congrats on the 5lbs, that's great. Love the clock, so many possibilities. Thanks for doing the tutorial for us. Congrats on the 5 lbs. I encourage you to keep up the walking as exercise is the key to good health. I appreciate all that you do for your fans! Hugs. Your clock is absolutely amazing! . . . I now know what my next project will be once I am finished making the CHA Ladies Diary Roll-Top Desk (almost there-yay) . . . I know it's time consuming to write the tutorials, but your tutorials are not only easy to follow, you add your humor in your writings & I find myself bursting out with laughter - so keep them coming!!! . . . and don't think of your walks as a way of losing weight but as a way of envisioning new projects for us to admire and make :-) . . . BTW congrats on the 5 lbs!!!!! You never fail to make me smile :) Your clock is wonderful and if I manage to finish all the other Christmas projects I am making, I'll add that one to my list fof someone (if not for myself lol) Thanks for all your hard work and dedication to sharing the fun. Blessings! Just put on your hat....you will be taller and look thinner.....I'm pretty sure!!!! Congrats on losing some pounds. Wait till your pants start feeling baggy! Oh joy! Wish I could say you've inspired me but I'm sitting here eating pizza drinking pop! Your clock is beautiful Jim I love it. I also love your roll top desk. You do amazing work my man. Congrats on the weight loss, its hard to taje off, I have been there and back many times.Good Luck and I know you can do it.